‘Tis the season for cookie exchanges, family gatherings, office potlucks and cocktail parties. And you know where there’s food—especially food you don’t typically see at other times of year—you bet the Food Police are going to be there. What’s worse is that often the Food Police aren’t strangers that we can brush aside – they’re often coworkers, friends, families, loved ones… People who we expect to support us, so we feel even more hurt by their words and actions. It may sound cliché, but it’s absolutely true – even when comments or gestures about food, dieting and bodies are being directed at you, they’re more about the insecurities of the person making the comment, not you. While that doesn’t necessarily lessen the harm that they’re doing, nor the hurt that you feel, keeping this in mind allows you to make space to feel compassion. We live in a culture that glorifies thin bodies and restriction (“diet culture”), and for some, striving toward the thin ideal is their way of showing discipline and “being on Santa’s good list”. Feeling compassion for the fact that this person may be making these comments because they don’t know better might give you a bit of space to respond differently, instead of reacting from a place of being upset, hurt and/or angry. Many of us are people-pleasers, and this can sometimes be taken advantage of during the holidays with the “spirit of giving”. Know your limits and don’t be ashamed of them – you are keeping yourself well and safe. This might mean that you limit the number of commitments that you make during the holiday season. It might mean that when you do attend events, you limit how long you spend there or who you decide to sit near and talk to. You may want to allow yourself to go outside or get away from the party in some way for a break in the conversation. What If… I’m the Food Police? On the surface, it may sound silly that we would be doing something harmful to ourselves, but diet culture is so widespread and insidious that it’s not uncommon to internalize those messages. It’s no coincidence that “I’m my own worst critic” or “I’m my own worst enemy” are common phrases in our vernacular. Like everyone else, you are living in diet culture, and being upset at yourself for your food choices, or not being as far as you want to be in intuitive eating is not going to help. A good place to start changing your self-talk might be imagining you are instead talking to a friend, or perhaps yourself as a child. Immerse yourself in anti-diet books, podcasts and social media. 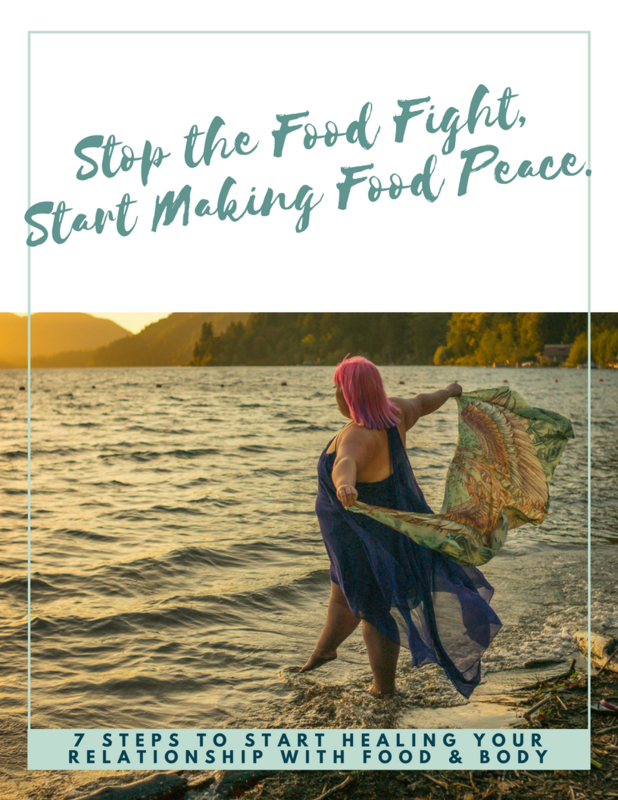 Check out this list of resources, my free eBook, Stop the Food Fight, Start Making Food Peace, or The Ultimate Guide to Guilt Free Holiday Eating, another free eBook compiled by Christin Morgan, RD. Have you ever run into the Food Police? What did they do or say? How did you deal with them?